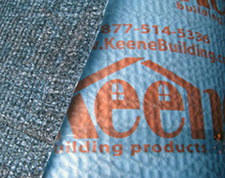 Profile: Éilan in San Antonio, Texas with Keene’s Noise Control Mat, Quiet Qurl! In “Mixed-Use” construction there are typically many extra details and precautions that a builder must take. The Éilan project, located just outside of San Antonio, is one great example of this. This multi-purpose facility is the home to apartments, condos, restaurants, shops, entertainment, and even a chapel among many others. 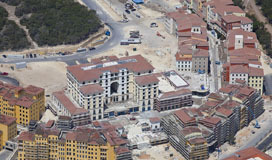 The developer, a division of a Dutch company, Wereldhave USA chose San Antonio for this project due to its population growth and the city’s unique charm. Inspired by the hill towns of Italy, the Éilan mixed-use development was built to have the charm of a “European-style” community and have the usefulness of a town center with shops and entertainment only steps away. Future residents can look forward to visiting the community’s amphitheater, dining from a selection of restaurants, or entertaining guests at the developments hotel. If a visitor were to grow tired of these amenities then they have the option to board the solar powered trolley stationed within the Éilan development, which will usher them into the neighboring San Antonio. With all these preparations taken, the developer did not leave out the details of comfortable living. With over 700,000 square feet of apartments and condominiums planned, there is potential for a lot of noise control issues to arise. To combat these issues, the builder chose to use Keene Building Products’ Quiet Qurl® 55/025 MC sound mat in their floor assemblies. Quiet Qurl® 55/025 MC is an entangled net acoustical mat that helps bolster an assembly’s ability to limit the sound that can pass from the floor of one apartment unit to the ceiling of another located below. Essentially providing a “floating floor” system. The Quiet Qurl® product acts as the spring in a mass-spring-mass approach of noise control. In this approach vibration waves cannot effectively pass through an assembly due to the airspace created between the underlayment and the subfloor, resulting in a quieter living space for the resident below. Meeting building code for noise control is a must in multifamily developments, as well as providing a comfortable and private living space for residents. With the addition of Keene’s Quiet Qurl® 55/025 MC to their floor assembly the development team at the Éilan multi-purpose facility have provided Comfortable living. Currently the leasing process is underway and the first multifamily apartment phase is set to be complete shortly before the close of 2011. When residents occupy their new living spaces they should feel assured that all aspects of their day to day life within this community has not only been meticulously planned, but also executed to provide them maximum comfort and peace of mind.